That’s by the Jewish-Danish physicist Niels Bohr (1885-1962). It applies to quantum physics in general. Without the full maths, you’re peering through a frost-covered window into a sweetshop, you’re not inside sampling the wares. But even without the full maths, the concepts and ideas in this book are still difficult and challenging, from the early puzzles thrown up by the ultra-violet catastrophe to the ingenious experiments that have proved particle-wave duality and action at a distance. But there’s a paradox here. Understanding even a simple book is far more difficult that understanding even the most advanced quantum physics. But subjectively it seems the other way around. The first ability is linguistic and ancient, shaped over millions of years of evolution. The second ability is mathematical and recent. Human beings haven’t been using explicit mathematics for very long, so it isn’t an intuitive and automatic ability. Hence the paradox: what countless human beings can do – speak, write and read – is more difficult than what very few human beings can do – understand quantum physics. Language is much more complex than the fundamentals of matter and energy, which is why we understand how language works much less well. Physics has attracted some of the greatest minds in history and almost every name in this book belongs to a genius, from Schrödinger, Fermi and Bohr to Feynman, Everett and Higgs. These men have achieved great things, but they’d have been less successful if they’d tried to study the human brain and its products, like language, consciousness and society. A deep understanding of matter is difficult because it’s just within the intellectual grasp of a few human beings. A deep understanding of the brain and its products is presently beyond anyone’s intellectual grasp. That’s why linguistics attracts much lesser minds and sociology attracts charlatans. In those subjects, men and women are working with superficial things, not the fundamentals. Biology attracts lesser minds too, partly because it is also more complex than physics and the data aren’t as easily accessible. When Schrödinger wrote a book called What Is Life?, he was speculating in a way he didn’t have to in physics. He didn’t know about DNA and the double helix, so he was free to suggest that genetics is a quantum phenomenon. It isn’t, so far as we know: it’s super-quantum, that is, based on chemistry. But there are suggestions, examined in the final, most speculative section of the book, that consciousness is quantum. After all, both consciousness and quantum physics are mysterious things. Although the symmetries are hidden from us, we can sense that they are latent in nature, governing everything about us. That’s the most exciting idea I know: that Nature is much simpler than it looks. The trouble is that the quote is attributed to two people: Steven Weinberg (1933-) on page 131 and Albert Einstein (1879-1955) on page 134. But anomalies are appropriate for a book on quantum physics. It’s also appropriate that both Weinberg and Einstein are Jewish. Here’s where biology comes in and I can say something serious and important about quantum physics. It’s a human activity, but not all humans are equally good at it. Most obvious of all, physics is highly math-culine: it’s dominated by men who are good at difficult maths. A woman wrote this book, but women have not been necessary for the creation and success of any hard science. Particularly not physics. But the men in quantum physics are not drawn equally from all groups: white Europeans and East Asians are over-represented. Jews are vastly over-represented, just as they are in chess, pure mathematics and high finance. This must say something about male brains in general and Jewish brains in particular. Somehow human evolution has equipped a particular sub-set, or sub-sets, of Homo sapiens to apply complex mathematics to fundamental aspects of matter and energy. Evolutionary biology says that, down the millennia, success at cognitively demanding tasks has translated into success at reproduction in the environments of Europe and Asia. But not in sub-Saharan Africa: blacks are vastly under-represented in quantum physics and all other cognitively demanding activities. The African environment was unsuitable in some way: agriculture, literacy and mathematics never developed there as they did in Mesopotamia, Asia and Meso-America. Once they arrived, those things altered the environment and so altered evolution. Here’s another apparent paradox: human beings didn’t evolve to do advanced physics. Somehow, success in other fields – agriculture, art, literacy, finance – has equipped some of us to do it. But why should those other things have equipped anyone at all to do it? What’s the connection between agriculture and calculus? To me it’s simple: at the most fundamental level, all cognitively demanding tasks involve difficult maths. That’s because everything involves maths: as soon as there are entities and relationships between entities, maths appears, because it’s about the inter-relationship of entity. In other words, all possible universes are made of maths. And when a brain is capable of representing external entities and their behaviour in some way, it’s doing maths. This maths became explicit in Mesopotamia, with the invention of writing. Writing is another way of representing entity: models inside the brain became symbols on clay, wood, papyrus, parchment and paper. Money is another kind of symbol-system and manipulating it is something else that involves difficult maths. Once writing and money became part of the environment, they began to exert evolutionary pressures: in the past, literacy and skill at finance have translated into more offspring, particularly among groups like the Jews and Parsees. In other words, skill-at-symbols was being selected for and symbol-skill means mathematics. The older symbol-skill – spoken language – is universal among human beings, but writing hasn’t existed equally long in all races or been equally important. That’s why some groups are over-represented in this book. The most over-represented group of all is men, of course: 50% of the human race are almost 100% of the important names in hard science. And without men, there would be no hard science. The extremes of almost all forms of human behaviour are dominated by men, whether it’s quantum physics or chess, stamp-collecting or serial killing. Men like to manipulate the world in some way and manipulation involves maths. 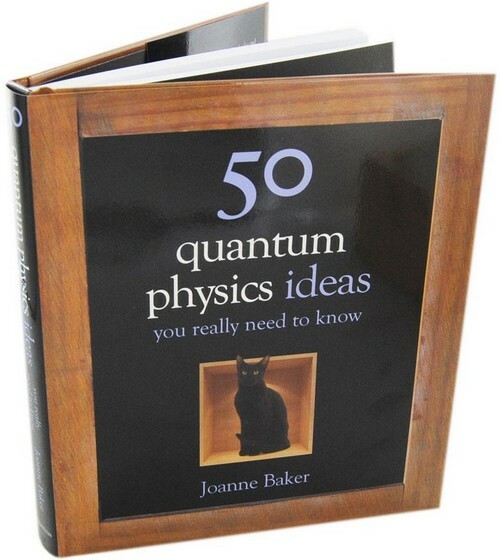 This book is about the most difficult manipulation of all, the symbol-sculpting of quantum physics. And even the shadows of those symbols – verbal descriptions of quarks, quantum leaps and black holes – are demanding on the brain. I think I’ll need to read this book three times to get them sorted.